Leaving city life far behind isn’t hard when Moreton Island, Brisbane’s most underrated island, is involved. Leaving city life far behind isn’t hard when Brisbane’s Moreton Island is involved. It’s easy to overlook the simple beauty of Moreton Island; Captain Cook certainly did. In fact, the illustrious explorer mistook it for part of the mainland as he sailed past in 1770, dubbing the main headland Cape Morton (Moreton is the result of a clerical error that came later), for James Douglas, the 14th Earl of Morton. Perhaps it’s this knack for flying under the radar that has protected it from major development since European settlement began more than 200 years ago? Or perhaps it’s that, unlike North Stradbroke with its paved roads and seaside towns, Moreton Island remains largely untamed; it’s 98 per cent national park, and a majority of the island is still only reachable by 4WD. As the MICAT ferry lurches and chugs its way across Moreton Bay – a surprisingly short 75-minute journey – I consider my friends who admit to having only ever visited once, if at all. It’s hard to blame them: for an island only 40 kilometres off the coast of Australia’s third-largest city, it gives the impression of being much, much further away. Getting to the island is a snap. Daytrippers and weekenders walk onto the ferry at Port of Brisbane, bound for the tranquil bayside waters of Tangalooma, its resort and its wrecks that are effortlessly accessible sans 4WD. You’ll find blindingly white sandy beaches, sunset wild-dolphin feeding, the Gutter Bar, with its afternoon drinks and fresh seafood, and The Wrecks campground. 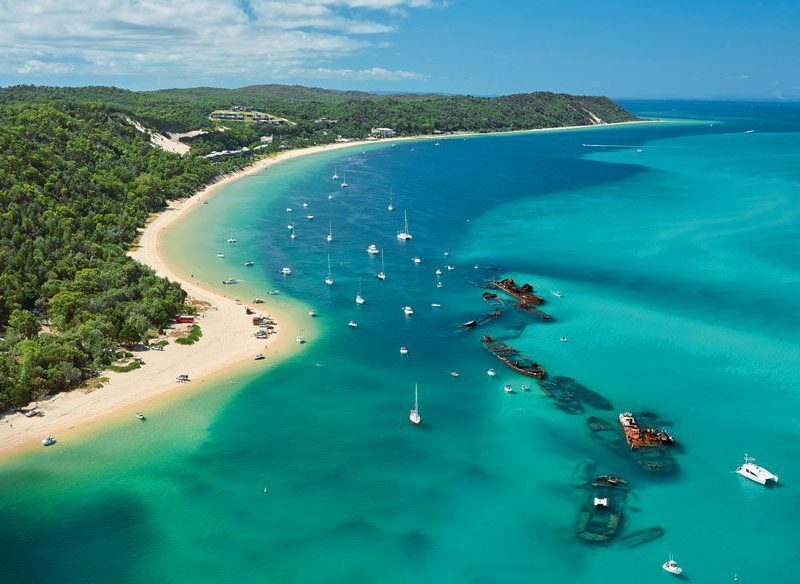 The rusted bones of Tangalooma’s famous wrecks sitting below the surface are snorkelling magic in a jade-tinted world, filled with flashes of silver and pops of colour as fish streak between the corroded hulls of 15 sunken ships and coral outcrops. For more advanced snorkelling and diving, head to Flinders Reef, Brisbane’s only true coral reef. Peak hour at Tangalooma Resort, Moreton Island. In the hills behind Tangalooma sits The Desert – a set of mammoth, windswept super-dunes built for high-speed sand tobogganing. Get on board with Australian Sunset Safaris and Tangatours, that can both organise tours to the rest of the island, too. If you want a taste of the true wild beauty of Moreton, then strike out for the eastern side. We spend the weekend trip scrambling up the striking face of Mount Tempest – the world’s largest sand hill at 285 metres – and zooming along the sandy beach ‘highway’, or bouncing through the island’s middle tracks, all after watching the sun break the horizon at Queensland’s oldest lighthouse on remote Cape Moreton. If you want beach on beach, The ‘Surfside’ (as it’s known by locals) is 27 kilometres of almost uninterrupted Pacific Ocean glory, where you can swim, surf and lay in the warm sands of six unpatrolled beaches. If you’re feeling more Brooke Shields than Baywatch, dash behind the dunes to Blue Lagoon, a large freshwater lake that’s a welcome reprieve from all the salt. Ocean quota not quite reached yet, we head north to float in the best kind of pool: the Champagne Pools, named as the water froths as it cascades over the breakwall – because nothing says ‘island holiday’ like bubbles. If only Captain Cook had known what he was missing.